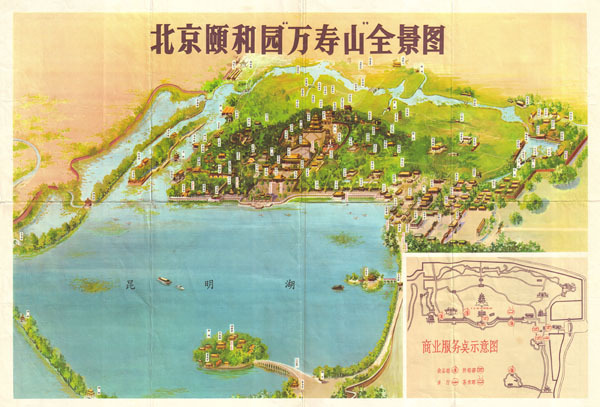 Rare post Liberation Chinese map of the Summer Palace, Beijing. A dramatic and stunning 1950 view of the Summer Palace, in Beijing or Peking, China. The stunning Summer Palace or Yihe Yuan, overlooks Lake Kunming and lies just northwest of Beijing proper. The Summer Palace compound, which comprises roughly 70,000 square meters, was declared a UNESCO World Heritage site in 1998. This spectacular color lithograph view details the entire summer palace and much of the artificial Lake Kunming on which it rests. Chinese tags name most buildings and important locations. Map in the lower right hand quadrant offers a slightly different perspective on the Palace. A rare and extremely attractive map. Issued just after World War II and the 1949 Liberation. Very good. Original folds. Some foxing and edge wear. Chinese text on verso.